Yesterday I had the pleasure of meeting one of my blogging buddies……. Marilyn was visiting town for her brother-in-law’s 50th birthday party and dropped me a line to let me know she’d be nearby. After a few emails and text messages, we organised to meet. I was selling raffle tickets outside our local bakery so here we are…..
You can tell I’m a local yokel !!!! !….Look at Marilyn in a t-shirt and me wrapped up in long sleeves and a vest!!!!! LOL I’ve been up north too long!!!! It’s always wonderful meeting blogging buddies….we discussed how easy it was to get on, even though we’d never met but, when you think about it, you are truly yourself on your blog….people who you get on with online, are people who you would surely get on with in a face to face situation!!! !……and we did! We had a wonderful chat for hours….the poor lady I was selling raffle tickets did all the work while we chatted and chatted…. (sorry Ann!!!) Pity it couldn’t continue, but we’ve made plans to meet up again sometime in the future and Marilyn even bought a raffle ticket in our wonderful raffle quilt, so who knows…..I may even have to drive down south to deliver it!!!! 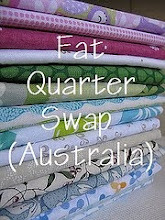 I also had the chance to catch up with another blogging buddy, Narelle, through our ‘Fat Quarter Swap’ this month. Her and I were tagged as partners this month and look what my gorgeous friend sent me…. I aab-so-lute-ly what she organised…..even the card had purple lavender on the front!!!! And look at that gorgeous lace butterfly!!!! I’m going to have to make something VERY special with this stash……thanks Narelle….you are such a sweety! It’s not too late to enter my 100 followers giveaway. Just leave a comment here and with the help of Mr RNG, I'll draw a winner later today! How great to have a meet up like that! The raffle quilt is beautiful! I love your little purple package....it is my favourite colour! That's lovely to get to meet a blogging friend. Good luck in the raffle Marilyn. Beautiful purple parcel there. Lucky you to finally get to meet up with a blogging buddy! Lucky you meeting up with Marilyn, she's such a sweety isn't she!!! 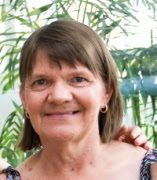 And you met Narelle too - what a great month you're having :o)!! Love all the purple delights, what a wondreful package!! 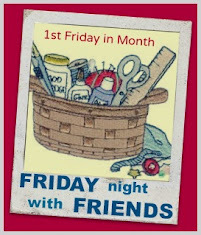 Raggedy Friends Flimsy and an Invitation to you….